What if your kitchen table could suggest recipes to you based on ingredients you place on it? Or kept your coffee warm while simultaneously charging your phone? 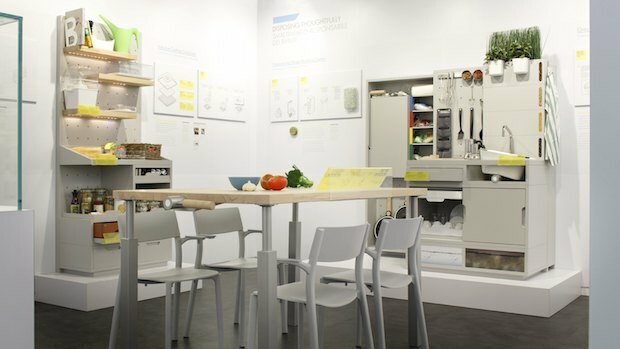 This is exactly what Ikea has in mind as part of its Concept Kitchen 2025, a totally networked food prep area and living space with furniture that interacts with both users and other nearby furniture. Welcome to the internet of kitchen things. Currently on display as part of Ikea's pop-up gallery at 2015 Milan Design Week, the prefabricated design megastore imagines a visible pantry that will use individual containers to store food at proper temperatures (thus doing away with the energy-gobbling fridge), a composting system that deydrates contents to create odorless compost, and a waste system that will sort and crush recyclables. To create its concept, Ikea analyzed a number of trends in order to predict what life in the kitchen would look like ten years from now. Scenarios included a more urbanized middle class with smaller homes, an increase in food prices, and much less time spent at the grocery store as households gravitate toward delivery services, creating local availability of global goods.